Should :focus and :hover styles be the same or distinct? I'm in the midst of redefining a cross-application style guide, and I want to make sure we're accounting for accessibility in the design, including contrast ratios, text sizes, and focus states. 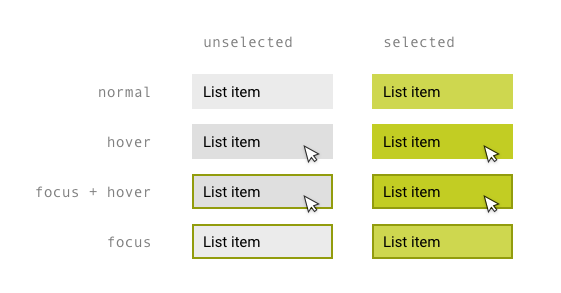 One issue that's been bugging me is whether the :focus state for buttons, inputs and the like should be the same as the mouse :hover state, or if it should be distinct so they could be layered together. I'd love to get some reasons why they should or shouldn't be separate. The :focus state, on the other hand, requires a separate scan of the entire page in order to determine which component is currently being targeted. For example, a user may press the TAB key a few times until a focus rectangle lands on a link, button or other input they want to access or "click" by pressing the ENTER key. The item that currently has focus needs to be obvious so that the user knows when to stop pressing the TAB key and can confidently interact with the focused target. It is common to place some sort of rectangle around a focused button that is easy for the user to spot. In the case of a hover event the mouse cursor itself fills this role so a focus rectangle isn't required. Honestly, as long as your :hover state & :focus state are very clearly showing exactly which item will have action the taken on it, I can't see any reason to style them separately. :focus is essentially a keyboard hover. The previous answer is correct in saying that a :focus element should contain a box around it, but as long as the outline property isn't hidden, it shouldn't be an issue. The only time it might be worth styling separately is if you are auto-focusing on items without the user directly interacting with them. All visual states can be combined in a matrix. Indeed focus needs more distinction than hover, but can also be combined when you hover over your focused element. These states can also be combined to unselected and selected items. Not the answer you're looking for? Browse other questions tagged gui-design web-app accessibility css style-guide or ask your own question. What happens when the focus rectangle isn't clear? Badge and indicator styles changing? Is it considered best practice to have buttonset hover and active to have the same style? Why should “cancel” and “confirm” button have the same size? What element should have the focus after a search?